Do you go to the gym? I have the luxury of a pretty swanky gym here on campus, so I’m trying to take advantage of it more this semester than in semesters past. I really appreciate the classes they offer – I’m seriously trying to get into yoga because I don’t have a bendable ligament in my body. I tolerate it, but I’m not in love with it, you know? But I do adore spin classes. Like. Love them. They have a way of totally clearing my mind and making me sweat out all of my anxieties and stresses. It’s a beautiful, hot mess of a thing. And I mean “hot mess” in the most literal way possible. Without getting totally gross on this here food blog, I sweat like a big, fat pig on a hot summer day. And my face resembles the flesh of a juicy red tomato. Every time. I bring water. I bring sweat rags. I wear light colors. Nothing helps. I am just a big sweaty fool at the end of each class. While I’m definitely not insanely fit, I’m not exactly Jabba the Hutt either. Must be the genes. Thanks, dad. But for some reason, I seem to be the only one in this severely moistened state. Have you noticed that there’s always a certain kind of girl who actually manages to look more put together after she works out? Like, how is that even possible?! How can you sit though an hour-long spin class and not have a single eyelash out of place? I applaud you, robot girls. You are way more composed than I. But I think I may know the true reason behind my unwarranted perspiration. I am thinking about these – aka. the best post-workout snackage I could imagine. Healthy enough to be a snack, and indulgent enough to be a dessert; that’s the kind of world in which I want to live. These Almond Joy Thumbprints are no-bake, which means there’s about 20 minutes of chilling time between the beginning of this recipe to the inevitable conclusion with you shoveling them into your mouth. One by one. Don’t forget to breathe. Dates and almonds form the base of these Almond Joy Thumbprints. The textures…oh man. 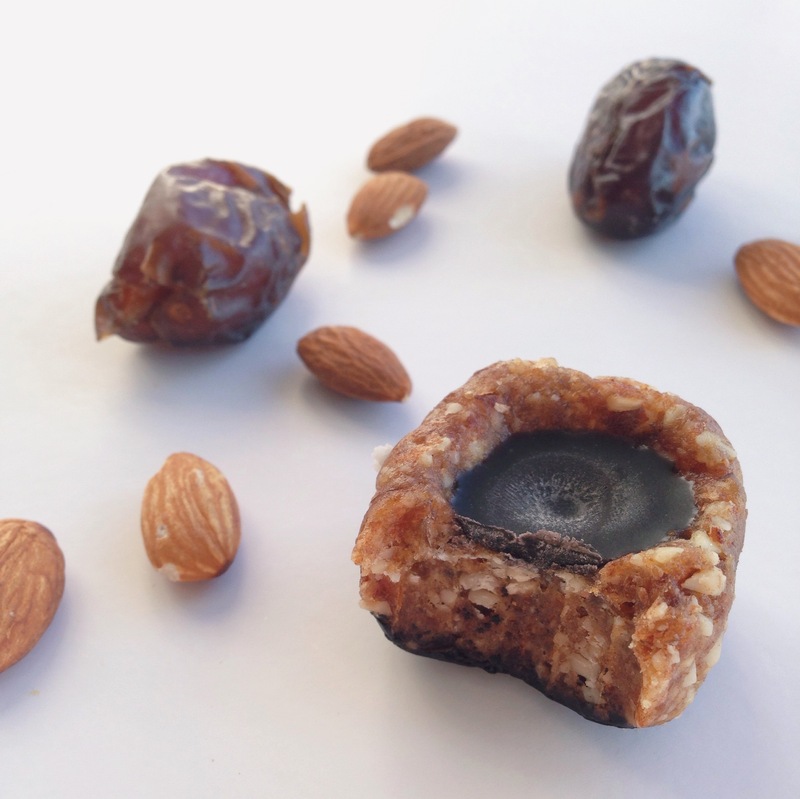 Sometimes you get a crunch from a chunk of almond, and other times you’re savoring the caramely goo from the dates. There really isn’t anything better. Add a pinch of salt to balance the flavors if you’re so inclined. We’re making chocolate coconut cream filling in the easiest way possible! Yay, convenience! Coconut butter is one of my all-time favorite foods. Talk about RICH – one spoonful of this stuff is all you need to satisfy even the most intense cravings. Not to mention that coconut is so incredibly high in good saturated fats; studies even show that coconut has the ability to aid in weight control. We also bring come cocoa powder to the party! I’ve never had a chance to use raw cacao (poor college kid here), but it will definitely work in this recipe to reserve the true raw status of this dessert. I chose Hershey’s Special Dark Cocoa Powder. I enjoy the richness of this variety, but feel free to choose whatever kind you like. You may, however, need to adjust the amount you use. No big thang. You can sweeten this deal with a kiss of maple syrup. Want to use honey, Honey? Have at it. You may just need a little bit of liquid gold here to round out the flavors. Just a dab will do ya. Oh, and add a pinch of salt, too. You won’t regret it. Last, I elected to dip the bottoms of these thumbprints in some of the chocolate I introduced in this recipe. Coconut oil, cocoa powder, maple syrup, vanilla, salt. Melt oil. Mix. Done. So simple. Crazy delicious. But optional. I highly recommend it though. It gives your Thumbprints a nice and uniform bottom. Hey, I like uniform bottoms and I cannot lie. Don’t blame me for the red faces and excessive sweatiness that ensues, knowing that these Almond Joy Thumbprint delights are luring you to your fridge! I warned ya! 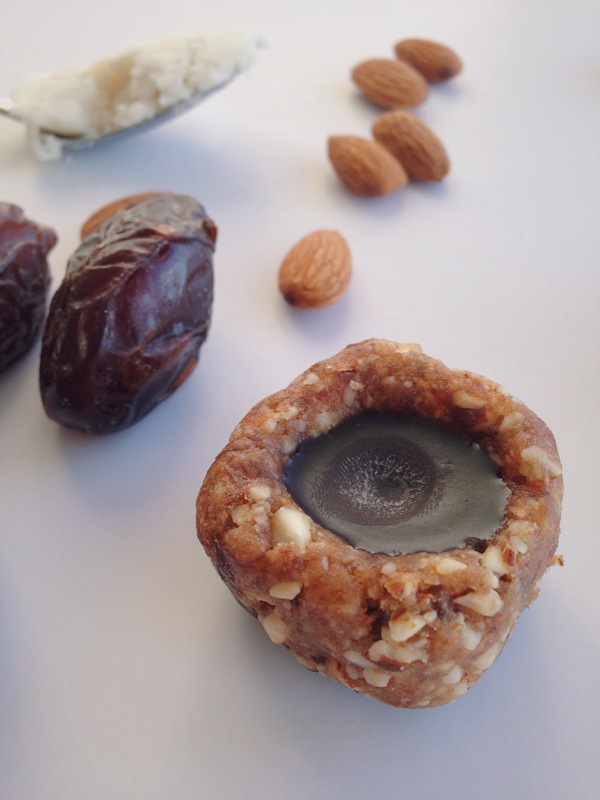 An addictive vegan and gluten free dessert made with sinfully succulent whole foods like dates, almonds, and coconut butter! You can indulge in these bites while nourishing your body with healthy fats, protein, and vitamins! 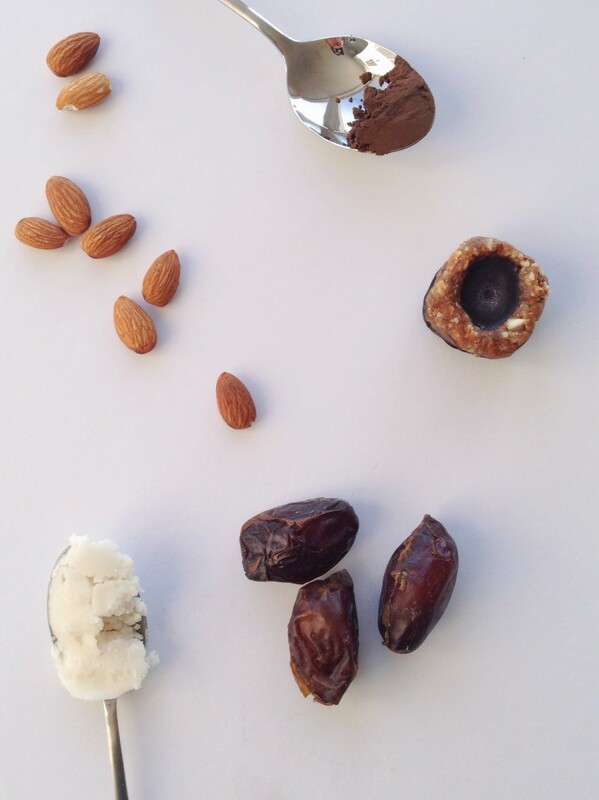 Make the base: In a small food processor or blender, blend the medjool dates, the almonds, and optional pinch of salt until a ball starts to form. The almonds will still have some texture to them, but you will be able to form the mixture into a ball fairly easily. The mixture will be sticky. Place in the fridge or freezer to chill. Make the chocolate coconut cream filling: Melt coconut butter in a small bowl in the microwave. Add 1 and 1/2 tsp. cocoa powder and optional splash of maple syrup and/or pinch of salt, and mix until combined. Set aside. Make the chocolate dip: Place 2 Tbsp. cocoa powder, 1 Tbsp. maple syrup, coconut oil, vanilla, and pinch of salt in a small bowl and mix to combine. Set aside. Assemble the Thumbprints: Remove your base mixture from the fridge. Measure out about 1 Tbsp. of the mixture and form a ball. Continue with the rest of the mixture. Make a fairly deep thumbprint in the circles. Dip the non-indented side in the chocolate dip. Place dip-side up on a plate, and set in the fridge to set. Once the chocolate dip is set, remove Thumbprints from the fridge, and flip dip-side down. Fill the thumbprint with the chocolate coconut cream filling. ** Store in the fridge. *I used Hershey's Special Dark Cocoa Powder. You may need to adjust the amount based on the taste. **You will probably have some of the chocolate coconut cream filling left over. I highly suggest storing leftovers in the fridge to blend into smoothies or to top oatmeal. Devine.